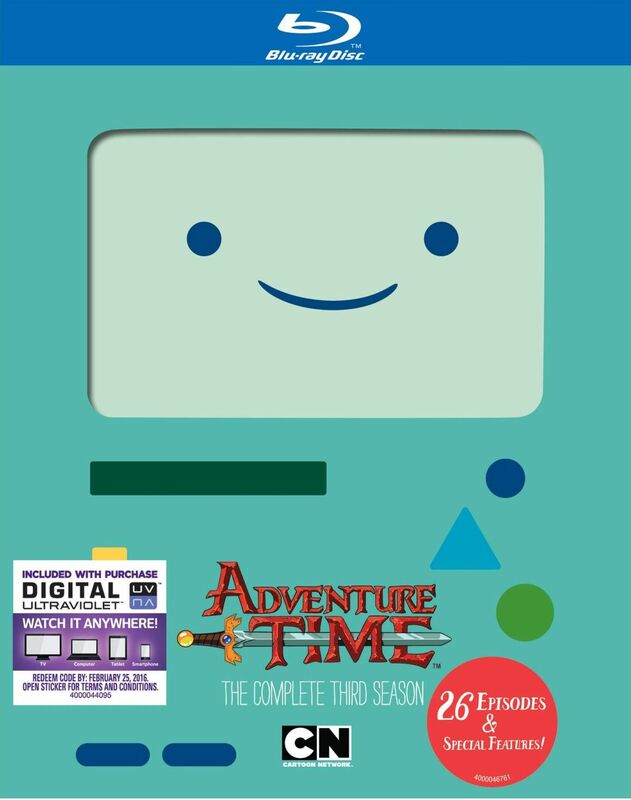 The third season of Adventure Time was released on blu-ray last month. It's been a busy month but I've finally had a chance to watch it all the way through. Like the first two seasons, I enjoyed it. Still not as much as Regular Show or The Amazing World Gumball, but enjoyable nonetheless. This season continues to find Finn the Human and Jake the Dog off on adventures, but this season also has some kind of unique episodes. For instance, there's one episode called "Fionna and Cake" which appears to take place in an alternate universe with a female version of Finn and Jake, Fionna and Cake. That was quite an interesting episode and at the end it is revealed what's going on. Another episode called "No One Can Hear You" finds Finn getting his legs broken and being knocked unconscious, awakening to an eerily empty Candy Kingdom. The only one around is a strange action Jake who explains that everyone is hiding to throw him a surprise party for his birthday. This episode has a much different tone than normal. Yet another unique episode is "Thank You" in which Finn and Jake and their battle with the Ice King take a back seat to another story with no dialog about a snow creature befriending a young fire wolf cub and trying to return it to its family. With no dialog, the entire story has to be told visually, and it succeeds. This release contains all 26 episodes of season 3, with each episode containing an audio commentary. Plus, there's a little featurette called “How an Idea Becomes Adventure Time”.